lunch always consists of a double-egg roll and a soya cappucino. a busy saturday lunchtime meant that aileen was hard-pressed to keep an eye on how my eggs were faring while serving regular customers and one heck of a lot of folks who dropped by for a mid-day coffee. though debbie's is generally busy on a constant basis, i must confesss, it's relatively unusual to be surrounded by so many people at the lunchtime munch. i'm not a great fan of chocolate, but small individual gluten-free belgian chocolate brownies were just too tempting to leave alone prior to wrapping up conversation and going back to pretending that i'm really a cyclist. the deal clincher was the word belgian on the wrapping. i'd not long hauled myself up the mur de ardnahoe on the bunnahabhain road, just to prove to myself that i still could, and frankly any form of food associated with belgium, however tenuous, was bound to hit the sweet-spot. the gluten-free bit was purely coincidental; i can take it or leave it. the two other members of the velo club peloton who had dropped by while dining was taking place were heading straight home; meanwhile i was off round loch gorm. 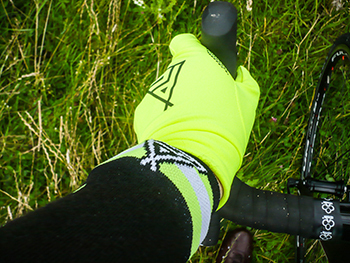 i had rather hoped that, much like continuing to wear bibshorts, the wearing of track mitts would be something that continued well into the beginning of october. 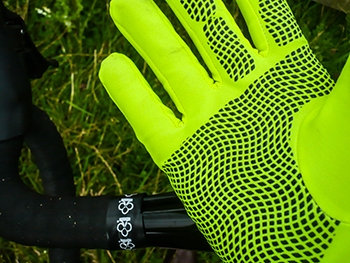 brian smith almost never wears gloves when riding and i'm darned if i'm going to let him win the scottish hard man competition. 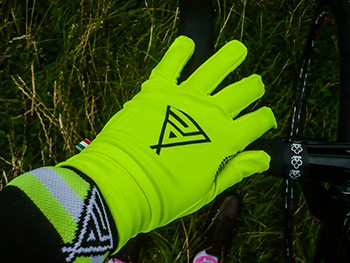 however, if you promise not to tell smiffy, on leaving debbie's, i'd stuffed my leather track mitts into a back pocket and donned prendas' latest super roubaix long-fingered gloves, decorous in fluorescent yellow. if i have to ditch in the sea, the rescue helicopter will see my waving first. that super roubaix is a remarkably versatile fabric, for though there were hardly icicles on the brake cables, the chilliness of the afternoon meant they were eminently practical, yet never quite overheated my fingers. the suprising bit was the little black dots on the fingers and palms. though rather obviously those are designed to aid grip on the bars and levers, i hadn't quite expected their tackiness to be quite so, well, tacky. it's a commonality on islay to implement the islay wave, a courtesy extended not only between motorists, but in our case, between cyclists and motorists. on meeting a motor car heading in the opposite direction, while i'd hate to give the impression i couldn't remove my hand from the shimano lever, those little black dots displayed a surprising reluctance to leave the rubber hood behind. sunday mornings in bowmore are generally quite chilly, even during what laughingly passes for an hebridean summer. it's mostly because the sun rising in the east leaves much of the village in the shade. on sunday past, i was more than grateful for that bright yellow super roubaix, despite the track mitts still residing in a back pocket. in fact, i don't mind admitting, i wore them throughout the entire sunday morning ride. they're not waterproof. in fact, it might be stretching credibility to attribute even showerproofness (is there such a word? 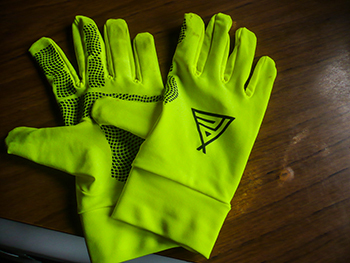 ), but at present, there's still sufficient heat in the ambient temperature to prevent nippy fingers when wet. the gloves weigh next to nothing, i figure they're probably thin enough to be worn as liners under heavier gloves when snow drifts are the rule rather than the exception, but i'll let you know when it gets to that time of year. at a cost of £19.95 a pair, purchase is verging on a no-brainer. in the words of billy connolly, the nights are fair drawin' in are they no?, the darkening of which means anything that might conceivably draw attention to your existence on a bicycle should be considered a good thing. sizes range from xs to xxl and i'd seriously suggest you click the link below before everybody else does. cycling is what i would describe as an activity with peripheral aspects, one in which it is possible to connect with others who may not occupy the same bicycle space as you yourself. it has much to do to with graeme obree's contention that you cannot golf to work, nor can you play darts to work or even football to the office. but you can cycle. therefore there are those with a vested interest in velocipedinal matters, yet no knowledge whatsoever of alejandro valverde, tom boonen or taylor phinney. they are most likely to be the individuals sat in the coffee shop wearing normal clothing, while you and i are clad in lycra and sportwool. however, we still drink the same coffee. conversation, should such meetings happen to take place, may initially revolve round whether the weather is opportune for cycling or otherwise, but is thankfully most unlikely to degrade into the relative merits of disc or caliper brakes or even a campagnolo versus shimano sort of discussion. for that we must be truly thankful. yet even at times of a common mindset, it is possible to make discoveries that are unrelated to the bicycle. yet it is the latter that brought them into being in the first place. in this specific case, might i introduce my good friend, john riddy. both of us rode the 2008 hot chillee version of londres-paris, the first edition to travel via dover and calais and in fact the first edition that eschewed a finish in versaille in favour of riding the champs elysées and arriving at the eiffel tower. sat on the bus en-route to collect our bicycles, i enquired of mr riddy what it was he did for a living, to which he replied with characteristic modesty "I'm an architectural photographer." with characteristic naivety, i assumed he meant he snapped pictures of finished buildings for architects to file in their portfolio. oh how desperately wrong my conclusion turned out to be. yet here we are, on a sunday afternoon in august involved in a conversation about photography, the subject matter of which has nothing whatsoever to do with cycling. however, it should be pointed out that john has up to this point, completed five consecutive hot chillee alpine challenges and is on course to attempt his sixth in a few weeks' time. 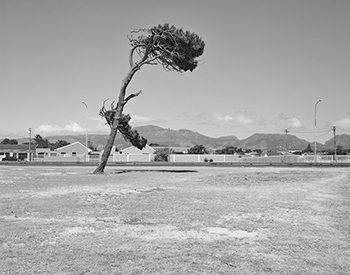 as to the photography, despite there being a distinct absence of bicycles in the imagery, his forthcoming exhibition entitled 'of things placed' hosted at the frith street gallery from 18 september until 18 december, features images of south africa's western cape peninsula. the exhibition is shared with drawings by the late james castle. in the context of this extra curricular discussion i'm proud to say that i wasn't actually looking for a cycling connection, other than the fact that john and i met in circumstances predicated by the bicycle and have remained loosely in touch every since. still with cycling at the core of the conversation. however, john told me that one aspect of the work that i might find of particular interest, "...they were all taken using a bike as transport. In a way they are a sister series (if that's the right term) to my Palermo series. Same way of working; repeated journeys and visits over a long period of time." it strikes me that, while there are those who have need of knowing at what pressure a set of tyres are being run, how often the nose bolt of a brooks saddle is tensioned and whether it's necessary to leave the dust caps on the tyre valves (it isn't), there are those who will be interested in with what john captured these stunning black and white images. "they were all taken using a digital back" and the subsequent photographs are 10x8 or 'full plate'. john has kindly allowed me to reproduce a few of his photographs on this page, but rather obviously, they are nowhere near the size alluded to above. therefore, if you wish to peruse further and in more salubrious surroundings than the relatively small screen of a computer, i would recommend a visit to the frith street gallery, situated in golden square, london. it will be well worth the effort. as i have frequently mentioned, along with very many others, i throughly enjoy watching cycle racing. i cannot deny that i have more affection for the one-day classics than for the three week grand tours, but i've found that if i simply consider each stage as a sunnier one-day classic, then i can probably get through all three weeks without so much as a grumpy expression. what i don't particularly enjoy is the seemingly ever-increasing punditry that now accompanies each major race. it used to be bad enough when the television coverage was preceded by at least one or two talking heads on a studio couch providing us with their expert countenance on the velocipedinal matters that were soon to follow. but now that social media has entered the fray, my timeline is often filled with tweets offering 'ten riders to watch', a stage by stage preview of the entire race, or even an interview with a rider who wasn't selected to ride for his team. i don't doubt that those self-styled experts are exactly what they say they are. i know for a fact that i am no expert, so it wouldn't take much to have greater knowledge than yours truly. but simply on the basis that they have yet to watch the racing that i am about to, there's really no way that anyone can know how things might pan out. you may recall the tour de france of 2011 in which it was expected that prince bradley would demolish the opposition and follow his fourth place of 2010 by standing atop the podium. unfortunately he crashed and broke his collarbone. i bet no-one saw that coming. 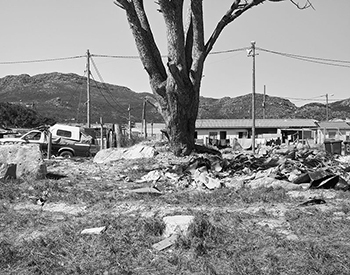 yet there still remains consternation in official circles that those of us metaphorically standing by the roadside are not being suitably served by the mundane standard of entertainment depicted on our television screens or internet feeds. in comparison with america's superbowl, they may have a point, but having attempted on several occasions to stay awake past the half-time show, the on-screen statistics more often than not have a tendency to obscure the football allegedly taking place. having said that, i am quite impressed with how they manage to place wording 'neath the players in real-time. 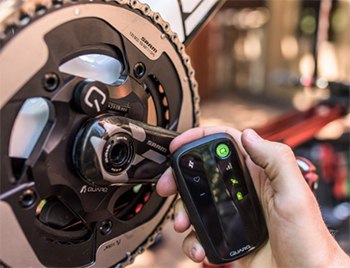 the riders' association, hereinafter referred to as velon have taken steps to alleviate this apparent mediocrity by attaching tiny cameras to one or two racing bicycles. disappointingly, these seem currently incapable of broadcasting the obscure viewpoints they might display; how much more exciting liege-bastogne-liege would be when seen from between a pair of frantically moving shaved legs. having watched one or two examples of such footage, suddenly i find myself missing the very punditry that was the subject of my ire only one or two paragraphs earlier. but such live telemetry it transpires is not only that which deserves to be broadcast to a tv audience of millions. 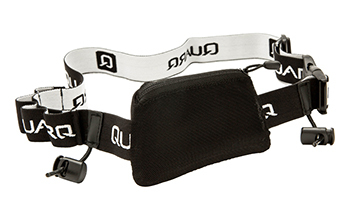 a bit like the faux celebrity achieved by having your very own facebook page, it is now possible to purchase and attach a quarq wireless unit to the rear of your seatpost, ready to broadcast your feeble efforts to an audience of unknown constitution. 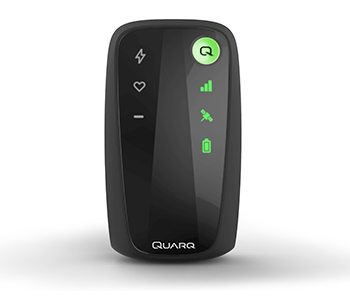 quarq race intelligence consists of a ruggedized (? ), waterproof, polycarbonate case containing gps, ant+ and a modem that utilises the mobile phone network to transmit every last digital slice to the great unwashed. not unnaturally, there is software required to gather all the aforesaid digits and compile them into an industry standard format. aside from what i consider an oddity that such technology is being trumpeted as commercially available to all and sundry, i confess to being a tad surprised that there is such a thing as an industry standard for the dissemination of such less than startling information. however, all this has not been foisted upon an unsuspecting public without first having made sure all works as described in the instruction manual. 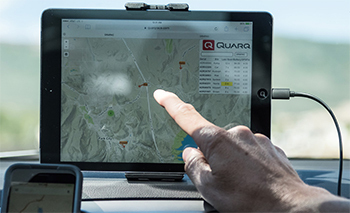 for at least the past season, quarq racing intelligence has been tested with both the drapac and axeon cycling teams, the latter participating in usa regional mountain bike races. i would dearly love to tell you how much such a device will cost you, should you deem it necessary to broadcast to youtube, facebook or twitter (always assuming, of course, that can be done in the first place). but a bit like trying to learn the price of a commercial offset printer, that's something that quarq seem to be keeping to themselves for the time being. for those of you who could care less, the cycling world is currently under attack from tweets and features emanating from about fourteen or more substantially sized halls in freidrichshafen, germany, where most of the world's major and minor cycle paraphernalia producers have laid out their stalls. in the trade, we call it eurobike. one of these years, i may actually travel across and visit, but for the meantime it would seem that so many members of the cycling media are already there, i can't for the life of me see what i would bring to the party. apart from maybe a bottle of san pellegrino. though as a famous cycling journalist i probably ought to know, i find myself sadly lacking when it comes being aware of the precise points at which the cycle trade aim their annual workflow. does everything really take a year, from the moment one eurobike ends until the next year's begins? or is it more a case of finishing at least one desirable item in late may, but keeping it in a darkened and padlocked cupboard until the end of august? as i said, i have no cognisant information as to which of the above options match the truth, but either way, it seems everybody launches everything at eurobike. 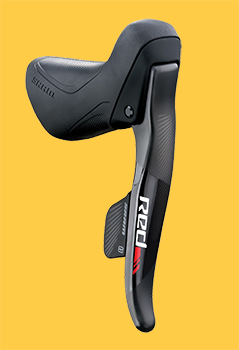 sram have already, on the very first day, unveiled their own version of electronic gear shifting in the form of sram red e-tap, perhaps unfortunately named (or maybe deliberately), because it sounds like the french for stage. maybe it's simply a happy coincidence. one more electronic groupset arriving a few years after shimano and campagnolo have already claimed their own space in this digital firmament may not, on its own, seem worthy of a flurry of adulation. 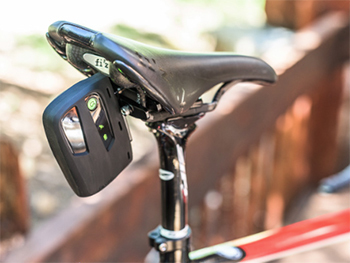 however, sram have stepped one pace further than either of the other two by making their's wireless. it is the sort of development that i thought either campag or shimano would have revealed first, and i've little doubt that both are feverishly working on wireless versions of their own respective electronic shifting systems. but when that inevitably happens, will it spell the end of versatility for the hapless carbon bicycle frame? i already have at the front of thewashingmachinepost bikeshed, a current review model that routes every cable internally even though its shifting system is entirely mechanical. 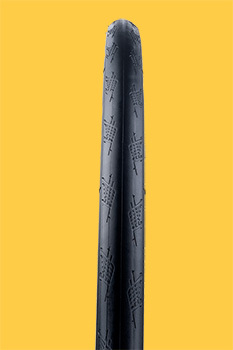 this method of concealing cables, while offering an admittedly tidy look, was more or less created by the need to keep thin and fragile electrical wires out of harm's way. it is a far better look than the first dura-ace di2 bicycle i reviewed which had the cables routed externally and held in place with zip ties. but will those new gateways to a monocoque's inner sanctum soon be deemed surplus to requirements if there are soon no more wires to conceal? yet not every modern technological advancement necessarily brings a flood of tears. 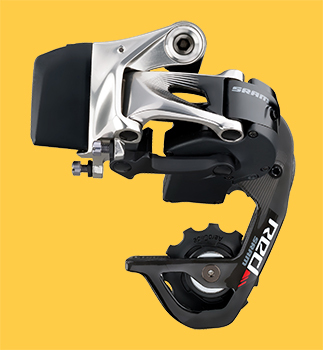 during the eneco tour, one or two of the professional teams were seen to be trialling uci sanctioned disc brakes on their carbon fibre as a means of easing the technology into the formula one peloton by 2017. a similar dispensation has apparently been instigated by the lads at aigle for several races in the 2016 season. while the governing body perhaps wishes to lose the image as technological detractors, rather than simply emulate the man from delmonte and say yes, they seem simply to be making sure of the pragmatism of their likely decision at the end of 2016 by giving the teams time to iron out the inevitable gremlins and prejudices before the brown stuff hits the rotating blades. 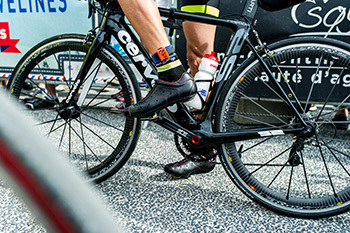 the advantages of disc brakes for carbon rims have been frequently mentioned prior to now. due to carbon's lack of heat conductivity, there has been necessary use of special brake shoe compounds in order to stop the bikes with amenable alacrity, but not always with suitable success in wet weather. moving the braking to a spinning rotor attached to the hub not only alleviates that problem, but negates a structural problem that reared its head when designing and manufacturing carbon clinchers. the announcement, therefore, by american wheel manufacturer zipp earlier this week that they were bringing to market both 28mm and 30mm tubulars and clinchers would surely have been a head-scratcher had they not pointed out that the clearances necessary to fit tyres of those widths were suddenly revealed by the disappearance of the ubiquitous dual-pivot caliper. that said, looking ever more closely at the three colnagos sitting in the bike shed, i'm still not sure that tyres of those sizes would make it past the frame clearances. however, the theory remains cogent. 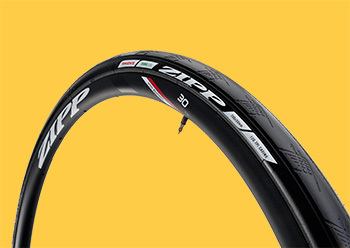 as the zipp press release states 'Research has shown that a larger tire has the ability to cut rolling resistance, making you faster than you would be with a traditional 23mm-wide racing tire. 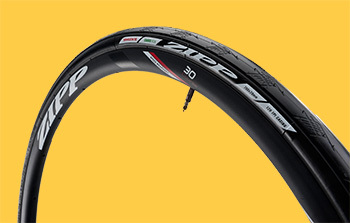 And of course, a larger tire offers improved grip in dry and wet conditions.' in the light of this contention, the veracity of which i have no reason to doubt, perhaps the incessant rumbling of approaching disc brakes has managed to confer some sort of advantage upon not only the professional, but the humble and far slower ordinary man in the saddle. if only they weren't disc brakes. "you can't buy happiness, but you can buy a bicycle and that's pretty close." in the mid to late nineties, our local newspaper purchased its first digital camera made by kodak. because there is no specific need for digital cameras to emulate the shape of the analogue versions we all know and love, kodak's tentative steps into the world of low resolution digital imaging resembled nothing more or less than a very big lozenge. as can perhaps be easily imagined, this made the camera slightly unwieldy to handle and led to more than just a few blurred images. the only saving grace was that the number of pixels available was so low, that often the quality wasn't high enough to see the blur in the first place. since those days, digital cameras have reverted to the shape and form factor that we have mostly become used to, easing the grasp for the inept and retaining the familarity experienced by the professional. they have also become completely ubiquitous, not only in the realm of what we might reasonably term photography, but as advertised on tv as being inside every smartphone on the market. the notion of there being almost 100 times the number of pixels inside a modern-day phone than in that first kodak digital camera is not lost on me. the upshot of all this pixelated imagery is that even those of us working in the realm of image-making tend to assume that every photograph seen in any situation will have been taken with a digital camera. i mean, who on earth would subject themselves to the faff and iniquities of analogue photography with its concomitant spool changing, developing, printing etc., etc. but every now and again, i come across a collection of images that have been snapped on film, yet my assumptions are still entrenched in the world of pixels. the race photos of philipp hympendahl are perhaps the perfect example, resulting in something of a faux pas on my contacting philipp for some more details about the imagery in 'beyond the finish line'. a goodly number of those populating the opening pages exhibit substantial, yet specific desaturation in certain colours. i not unnaturally asked philipp if this was achieved in post production and why? 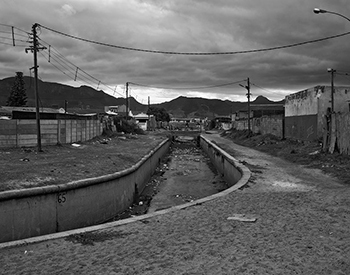 "I photograph on a old 6x17cm film camera, which is really difficult when photographing cycling. I have to manually focus and I can take only one photo before I have to manually wind on. With this technique you have to think in advance and be well prepared, but then you have a chance to produce something different than the norm. 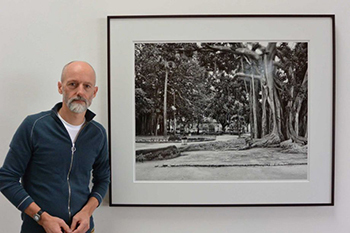 "I wanted to present a very personal view of cycling along with the chance to print the pictures realy large afterwords. I had this old camera, so I gave it a go. "The project nearly came to a early end after my photolab destroyed a long weekend's work at the Tour de France three years ago. But then I got in touch with the guy who takes care of my post production. He scans the films creating the end look as presented in my book. This process takes time and costs money. the imagery runs the full gamut of cycling photography, from dynamic race footage to a wide panorama shot of a gaggle of hympendahl's peers all but concealed amidst a forest of enormous lenses. we're all likely well-used to the sort of reportage photography that appears in the monthlies, but nowadays we all want more; all the paraphernalia that surrounds the act of racing itself. 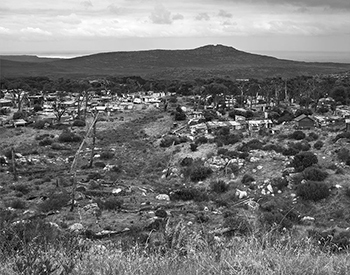 what inspires philipp to focus his photography on cycle sport? aside from having an impressive eye for a photo, hympendahl has a penchant for riding his bicycle a tad further than most of us might consider. he has featured on the post most recently in connection with dromarti leather shoes by whom he was sponsored in the recent paris-brest-paris. 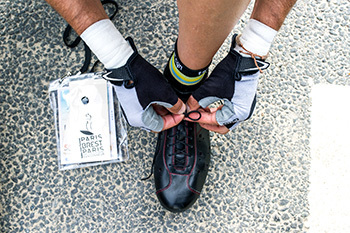 i can think of several cycle photographers who enjoy being in the saddle almost as much as behind the lens (scott mitchell springs most recently to mind), but none that i can think of would undertake the 1200 kilometres required of paris-brest-paris. other than exhausting, how was it? "As a cyclist I started to become more interested in a mixture of adventure and sport; that's why I decided this season to try long distance cycling. PBP was such a great journey with very nice, interesting and crazy people. You have such a great distance to cycle, that the riders stick together more than normally. There were long hours of darkness and tiredness, plus I had a lot of pain. Your inner voices tell you to stop, but something makes you carry on and on." "In Brest i wanted to give up, because I figured I'd suffered enough. But relief of simply channging my clothes off gave me the impetus to carry on. And once you change direction towards Paris that's a big help. 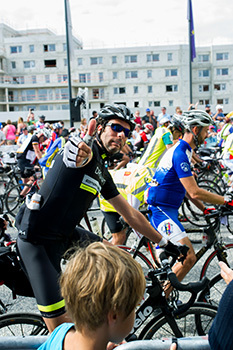 "The last third of the race I cycled with an English guy and later with a whole English group. One guy, even older than I am, was on a single speed; great. I decided then that it wasn't a race any more, because the group was so great we just stuck together to the finish. 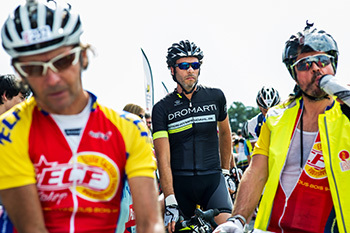 attacking a lengthy ride such as pbp is one thing; simply to finish the event really has to be considered amongst one of the biggest challenges in modern cycling. but it's highly unlikely that those who enter are only there to make up the numbers. there are specific goals to be achieved, possibly collateral from a focused training programme, but perhaps as a result of a personal challenge. after all there are specific qualifying races that have need of completion prior to setting off from paris. had philipp achieved his own goals for the event? "I am very happy with the way it went. My time was still pretty good concerning all that happened en-route. I lost my way once and did missed the direction signs at one point, riding some extra miles in the fog of an early morning. That cost me about half an hour." aside, however, from a career of image-making and this seemingly insatiable desire to ride a year's distance in a matter of days, philipp has a third string to his bow: that of research and development practitioner. you may recall from my previous feature on the man that dromarti proprietor, martin scofield has sponsored hympendahl to attempt riding his shoes to destruction. the sponsorship arrangement involves a practical means of gathering information that will subsequently improve the end product. how did the shoes fare over those 1200 kilometres? "The shoes were really good and my feet were more or less one of the few pain-free areas. But my backside is still not ok and there are parts of my hands where I still have no feeling." 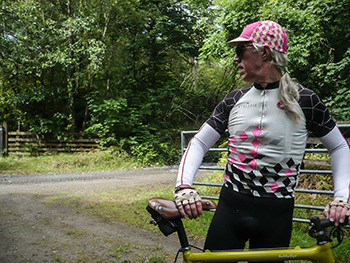 though i've never even come close to riding such a distance at one sitting, there have been one or two occasions when i've suffered numbness in places where i'd have preferred not to. on none of those occasions have i ever thought, 'i don't think i'll do that again.' however, my recall features only a couple of hundred kilometres, nothing like the 1200 that gave philipp a pain in the backside. 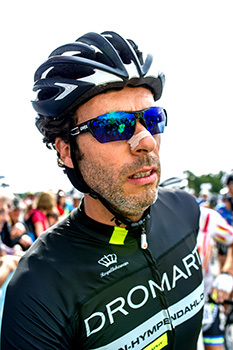 after pbp, does hympendahl have any future plans for any more lengthy bike rides? "I've not made up my mind, but the fact is that I cannot go much further than I did. Due to an accident when I was younger, I have problems with my right knee and my left ankle, both of which were swollen really badly. My mind could cope with a RAAM, but my body would not." it is often said that a picture is worth a thousand words, thus impeccable imagery such as included in beyond the finish line therefore surely must benefit from being accompanied by the words of tim farin. 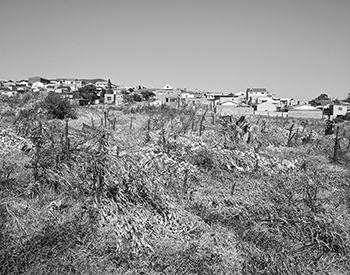 the introduction, however, makes it quite plain that farin's words are not intended to be a commentary on or description of hympendahl's photography. "Neither the pictures nor the text are designed to answer specific questions or fit a set pattern of storytelling." farin's essays are, if anything, atmospheric. inflections garnered from the arena of professional cycling that assist hympendahl's own photographic storytelling. combined over the book's 127 pages, the end result is quite superb. there have been discussions recently both verbally and in print on the island, perhaps originally curated by yours truly, about both the numbers and size of recreational vehicles or mobile homes that have made their way to islay over this past summer (a word used strictly in the conventional sense and bearing no resemblance to the usually associated weather). islay has a finite amount of accommodation available, something that previously maintained a respectable number of visitors each season. and at the risk of being somewhat elitist, also the social strata from which those visitors were drawn, due to the expense of travelling to the isle before considering the cost of a week's self-catering or guest house accommodation. the recent instigation of ret (road equivalent tariff) has reduced the cost of bringing a non-commercial vehicle to many of scotland's western isles, including the now much-maligned motor homes, so their number has increased substantially in the last couple of years. the downside to this state of affairs is two-fold. firstly, most of those visiting in this peripatetic manner tend to rely on self-sufficiency. in other words, they bring pretty much everything with them, contributing little or nothing to the local economy. secondly, and more pertinent to those of us who cycle hither and thither across the island's network of single-track roads, many of them demonstrate a distinct inability to drive these behemoths with anything approaching consummate skill. that most of them are hired only adds to this iniquity. thus, if i have need of explaining myself in more graphic terms, meet one of these overly wide vehicles on the road to kilchoman distillery and there's very little chance that they will a) remain totally oblivious to anything resembling a passing place. b) be incapable of driving the vehicle into said passing place, and/or c) not be able to reverse at any point of the proceedings. whether something is done to restrict the numbers arriving on the daily calmac ferries, as is done in colonsay and tiree is something i believe is about to be under consideration, but meantime, there are young (and old) cyclists to consider. for not only are the roads becoming choked with gargantua, they are becoming increasingly occupied with more motor cars than we're all used to over here. i realise that the latter problem is one that affects pretty much every part of every industrialised country in the western world, but on this rock in the atlantic, it may be happening more subtly than is good for velocipedinal matters. for those who do currently hold a driver's licence and make use of it on a daily basis, possession of this illustrated piece of card depends on successfully undertaking an indeterminate number of lessons before passing a driving test. until the latter is completed, it is illegal to drive any car without a licence holder in the passenger seat. cycling, however, is inordinately free from any such restrictions. for many, this is the very ticket to freedom; nip to the local bike shop, purchase something suitable and the world, apparently, is your oyster. there is no need to purchase insurance and no need to pass any sort of test. simply clamber aboard and head, prepared or otherwise, into the melée. personally, i think there is something fundamentally wrong with that. currently, whatever passes for the cycling proficency test has no teeth; even if you fail to pass, nobody has the right to stop you riding your bicycle anywhere you darned well like. whatever happens to the increased influx of motor homes onto the southern hebrides is really neither here nor there. i think it may be time to seriously consider some form of compulsory national cycle training, not because motorists have to submit to the time and expense of so doing, but because if we want cycling to become an inherent piece of modern society, it might be prudent to make sure potential participants can survive long enough to enjoy it. like most of you, i'd describe myself as a bike rider or a cyclist. that seems a basically descriptive admission that offers nothing in the way of pretension but more or less everything by way of information. granted, it gives not a clue as to how good or bad a cyclist i am, but i prefer to think that is something for others to judge. after all one's ability on the bicycle is surely a subjective matter. overstatement at this point would surely smack of egotism? however, i do allow myself a wry smile when a directeur sportif alludes to the athletes under his direction. it's not that i don't agree with the description, but my sheltered upbringing had me regard only those who ran 100 metres in mere seconds as athletes, or the chaps with the javelins, shot putt or even the long jump. because they participate in what the tv refers to as athletics. cyclists ride cycle races, or at least some of them do, though i don't include myself in this particular subset of the venn diagram. however, the epithets athlete or athletic have positive connotations associated with them. if i were to walk into debbie's on a saturday lunchtime and folks murmured such words under their breath, i would feel a comforting need to smile silently to myself. 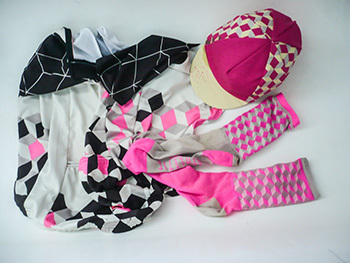 therefore, when several rather attractively designed pairs of socks accompany a castelli custom cubiste cycle jersey and matching casquette all the way from portland oregon, obliquely emblazoned with the athletic logo, the subsequent wearing has already acquired a positive ethic before the outcome is decided. the iconically named the athletic, whose encouraging motto is 'can't stop, won't stop. ', consists of renowned french cyclocross rider, julie krasniak, husband jeremy dunn (who you may recall from the rapha continental), zach rotstein and alexis ho. a fine balance between male and female influence on the product line. 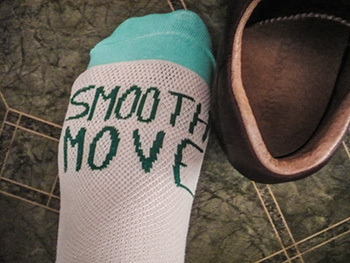 on the basis of my received selection of socks, this may well be their secret weapon. the retail section of the athletic emporium initially consisted predominantly of socks, with the occasional t-shirt included for good measure. however, more recently these have been augmented with the aforementioned castelli produced, athletic decorated cycle jerseys, available in hot pink (as reviewed) or blue. 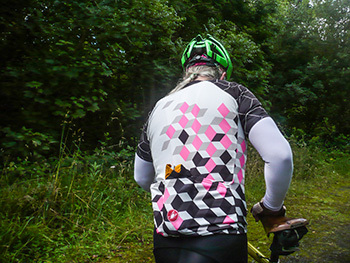 the former consists of a collection; jersey, casquette and matching socks. castelli's reputation for cycle garb of any hue or description is well nigh impeccable, and the la cubiste jersey does nothing but reinforce this apprehension. featuring a full-length zip, three capacious rear pockets and a beautifully idiosyncratic graphic, after the first wearing, i hand-washed it that selfsame evening and hung it out to dry in order that i might wear it once more the following morning. generally speaking, socks are socks. they do what they do, and the majority do so to the best of their ability. 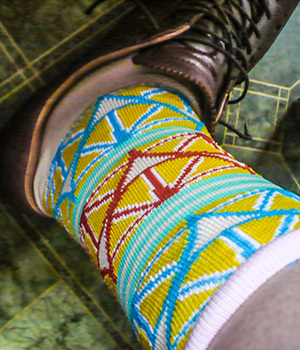 at the risk of coming across as just a tad pretentious, the athletic's socks are quite different, and not only because the majority are not a perfect match. in this i do not mean the sizes are different, but that the patterns are complementary. thus, if i may take the la cubiste pair as my example, the bits on one that are pink, on the other are beige. and vice versa. and they look very much the better for it. having counted over forty different pairs of socks on the athletic website it seems that not only can they not stop, won't stop, they've covered pretty much every foot-based base. 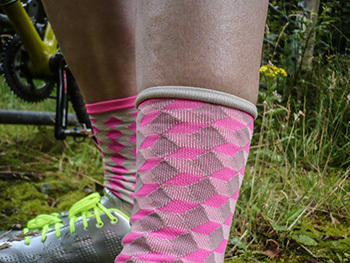 where else in this velocipedinal world is it possible to buy a set of three socks? 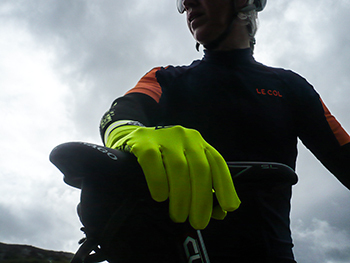 everything, including the cotton casquette are of impeccable quality, adding more than just a subtle frisson to the sunday ride. or any other day of the week, for that matter. pdx might still be very much where it's at.